How can a room so small and meant to help you stay clean end up so messy – so quickly? Today I’m sharing my top tips for cleaning your bathroom quickly and how to deep clean your bathroom. I used to take my time with cleaning the bathroom going as far as scrubbing grout on my hands and knees with a toothbrush. Then I had a kid, started my own business, and got super busy. It was around this time that I stopped using baking soda and vinegar for my weekly bathroom cleaning and started using this all purpose cleaner and this toilet bowl cleaner. I needed to cut my normal cleaning time down as much as possible so I had more time for my family and my business. I adapted a daily and weekly cleaning routine that cut all of my cleaning time down. My normal daily and weekly cleaning routine is pretty simple and detailed below. Everyday I will clean up my bathroom by wiping down the counters and sinks after use. This keeps the sink looking clean so that the weekly cleaning is focusing more on the tiny crevices. Once a week I tackle my weekly bathroom cleaning. I put toilet bowl cleaner in the toilet, spray down the shower, and spray down the counters. Next, I wipe down the counter, clean the mirror, and scrub down and rinse out the shower. Leaving the toilet for last I use a toilet bowl brush to clean the toilet then wipe down the top, tank, lid, rim, and under part of the toilet. I sweep and if needed do a quick mop of the flooring. The whole thing from start to finish takes about 15 minutes because the daily tidy keep the bathroom clean longer. Once a month or so I do a bathroom deep clean where I get into each and every crevice. This is where I get super in depth on my cleaning. Deep cleaning your bathroom is all about getting into all the little crevices where germs hide. If you do the daily and weekly cleaning like I do the deep cleaning doesn’t take that long. How you clean your flooring is completely dependent on what type of flooring you actually have. I prefer using Murphy’s Oil Soap on all my flooring types. I have used vinegar, pine sol, and dish soap too. I first sweep or vacuum my floors, corners, behind the toilet, and along the baseboards. This makes sure any hair, dust, or other little particles get picked up first. Then with hot soapy water I hand wash my flooring because I can easily wash the rag and remove any germs. I feel like a mop just spreads the germs around and I hate the sound the mop head makes in the washing machine. As for the grout this is about the only time I recommend using a homemade cleaner. It’s 2 parts baking soda, 1 part hydrogen peroxide, and a small squeeze of dish soap. It will be a bit watery so just pour it on the grout and let it sit for 5 minutes. Then scrub and wipe up with a wet towel. I only really focus on my grout itself once every six months or so because it’s just not necessary to clean more than that in our home. Add it to your schedule based on how often you need to clean it. Your bathroom sink sees lots of action; face washing, hand washing, and tooth brushing, on a daily basis. Sanitizing your sink is extremely important. I recommend once a month getting into your sink with a scrub brush and all purpose cleaner. This gets around the drain, the fixture, and the extra drain hole in your sink clean. For cleaning build up around your fixtures I recommend using vinegar in a plastic bag and wrapping a rubber band around it. After about 20 minutes of soaking a quick scrub with a bristle brush should get rid of any remaining hard water build up. If hard water isn’t an issue for you a great all purpose cleaner should do just fine. Spray it on, scrub, and rinse it off. There is one important tip I want to give you today. Something that I figured most everyone knew until one day I realized just how many people don’t know. Do not mix a bleach product with pretty much anything else. The fumes can cause severe headaches or even cause something similar to a gas that will cause burning. Always be aware of what type of cleaners you are mixing. I personally never use bleach products. I don’t care how great they are at disinfecting I hate the way bleach smells and cannot stand it in my cleaning products. 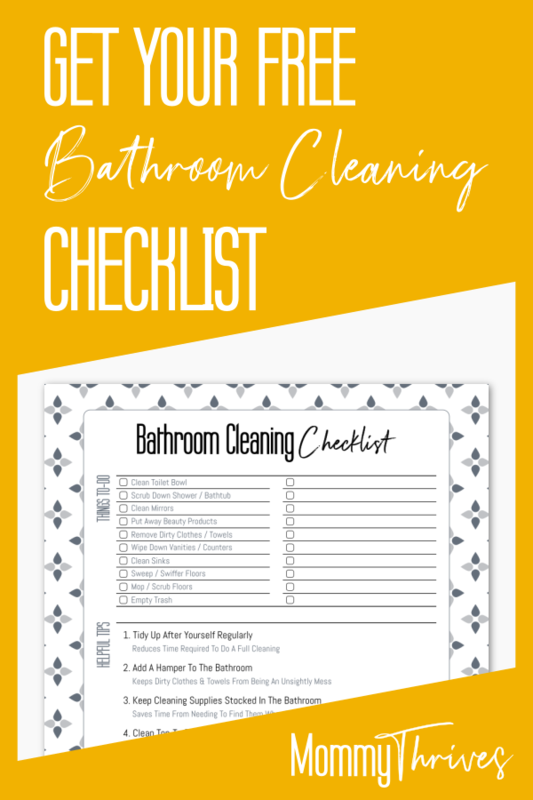 Make sure you grab my FREE Clean Bathroom Checklist below. Frame it and use a dry erase marker in your bathroom to make sure the bathroom gets tidied up every day and cleaned every week. Remember, quick cleaning your bathroom everyday will stop you from needing to do back breaking scrubbing of your tiles and grout. A weekly cleaning will keep it sanitized so you only need to do the a deep cleaning once a month. What products do you use and love to clean your bathroom with? Let me know in the comments below. Follow me on Pinterest for more like this and pin this to your favorite cleaning boards.